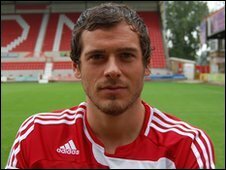 Brighton & Hove Albion have signed Swindon Town defender Gordon Greer for an undisclosed fee. The Seagulls had a bid for Greer turned down last month but at the time Robins boss Danny Wilson admitted he could leave if Brighton offered enough money. The 29-year-old Scot completed his medical on Tuesday and has signed a three-year deal. Greer signed for Swindon from Doncaster last summer after a successful loan spell the previous season. He made 53 appearances for the Robins last season but missed the play-off final defeat by Millwall at Wembley because of suspension. The red card he was shown in the play-off semi-final, second leg at Charlton means Greer would be unavailable for Brighton when they play Swindon on the first day of the 2010/11 season at the County Ground. Swindon chairman Andrew Fitton told BBC Wiltshire: "I understand why he might think the move is a good decision. "Gordon was a great acquisition for the club, he's a good guy who showed leadership when leadership was required. "Every player has his price and when that price is met, and if the player expresses an interest that he wants to go, then in this world there is no loyalty. You have to let him go." Brighton manager Gus Poyet told the club's official website: "Everyone knows we are looking for an experienced centre-half and Gordon is the type of player we wanted. "He is an experienced defender and had a very good season with Swindon helping them reach the play-offs." Greer started his career at Clyde before moving to Blackburn for one season in 2001. He only made two appearances before moving to Stockport but was again limited to just a handful of games. Three seasons with Kilmarnock in the SPL followed before Greer signed for Doncaster but he made just 10 league starts in two years. Swindon took him on loan in January 2009 and made the move permanent that summer.